Innsbruck's historic centre is a perfect setting for the biggest Christkindlmarkt in the city - the famous 'Golden Roof' is the centrepiece of the market in the old town with a backdrop of the Tyrolean mountains behind to add to the magic of the location. Nowadays the city centre markets almost join up with one another, with the market by the river and in the main shopping street on the fringes of that central market. There are also other smaller markets dotted around other locations in the city. Location: In wide pedestrianised shopping street opposite the tourist office. This market is located near the one in the old town on the other side of the road along the banks of the River Inn with lovely views over to the Karwendel mountains behind Innsbruck. One of the more spectacular Advent markets around - this one is located at the top of the Hungerburg train from the town centre and boasts terrific night time views out over the city. Wilten is one of the oldest parts of the city and this market is located away from the city centre on the southern side near the inner ring road. Take a look at the Tyrolean past. Although now part of Austria, the Tyroleans have a long and proud history as an independent people. One of the periods that defines the identity is the Napoleonic era, and the Bergisel (where the ski jump is located) is not only the site of major battles from that area, but also where the statue of Tyrolean icon Andreas Hofer is situated alongside the Rundgemälde (a circular painting depicting the events of those days). Sample the white stuff. 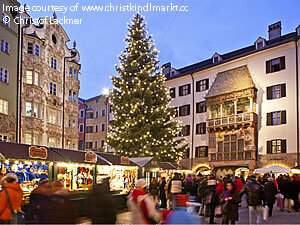 Given good snow, Innsbruck's ski resorts may well be open towards the end of the Advent period. (And one of them can be reached via an underground train stop near the Imperial Palace in the centre.) The nearby Stubai glacier ski area is also easily reached and is guaranteed to have decent snow at this time of year. Get out and about in the city. 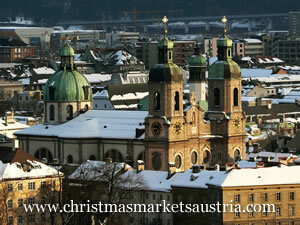 Innsbruck is a young and active city in the mountains. A university and a big teaching hospital mean that there is plenty going on both in the cultural scene and with outdoor pastimes. Innsbruck Airport is one of the most convenient regional Austrian airports. Located only a few kilometres to the west of the city centre, there are regular local bus services, while the motorway system up and down the Inn valley and over the border to Germany and Italy is only a few minutes' drive away. Innsbruck's main railway station is about 10 minutes' walk from the pedestrianised area at the heart of the historic part of the city. With Innsbruck located in a central position in Europe there are good connections in all directions to other countries. The local train, tram and bus services in the area are run by the Verkehrsverbund Tirol (VVT).